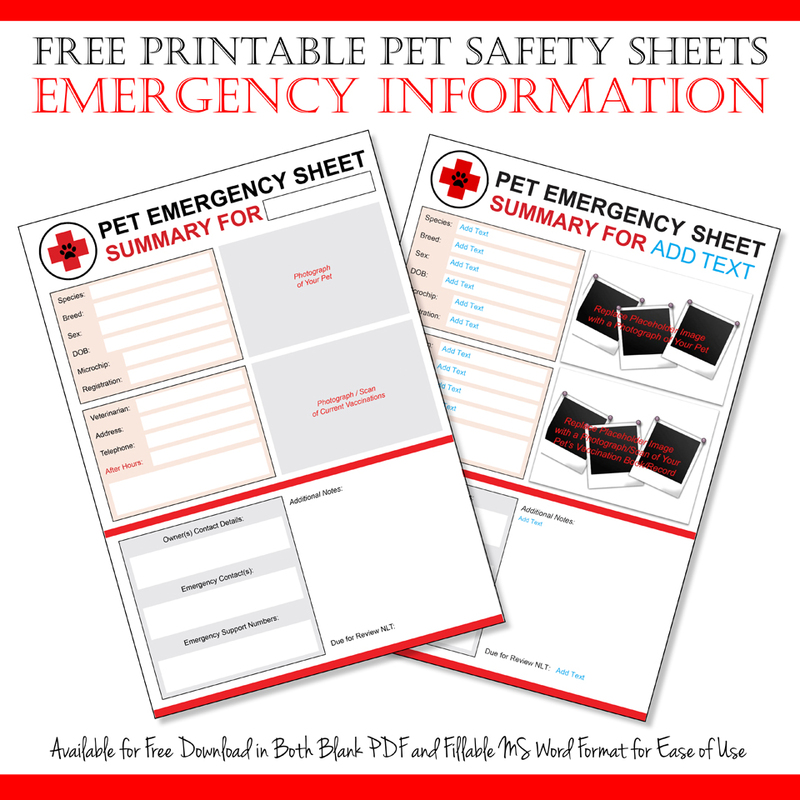 I had been (procrastinating) planning to refresh our first aid kits and other family readiness supplies and plans during the winter; however, I pulled things ahead a little this week after our furfriends at The Golden Scoop shared a pet preparedness post for Animal Disaster Preparedness Day (USA). 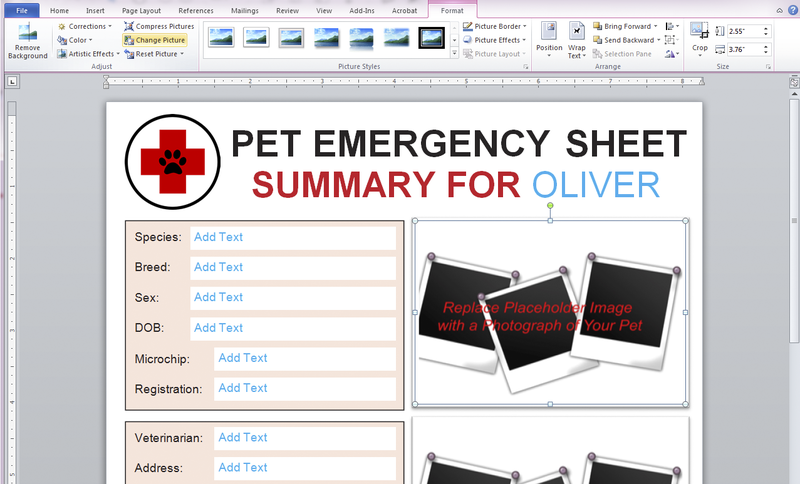 Our first aid kits are in progress (will share) and I finished updating our emergency information sheets this morning. 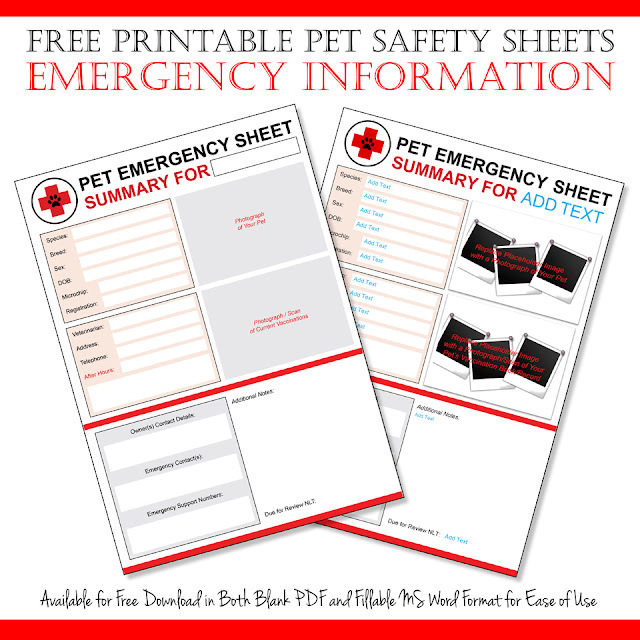 We keep a binder of records for each of our pets; however, in the event of a medical emergency, home emergency, or natural disaster, it helps to have essential information readily at hand in your first aid kit or go-bag. I also recommend keeping a copy on your mobile phone and a safe back-up location with either a trusted person or secure online file. You may not be at home when an emergency strikes and if you are, it may not be safe to access your go-bag in a reactive emergency. In addition to the handy infographic shared at The Golden Scoop, the ASPCA Disaster Preparedness website has comprehensive information for pet preparedness planning and most national/local emergency organisations have guidance for your specific location. This is particularly helpful for local threat awareness and relevant resources/contacts. 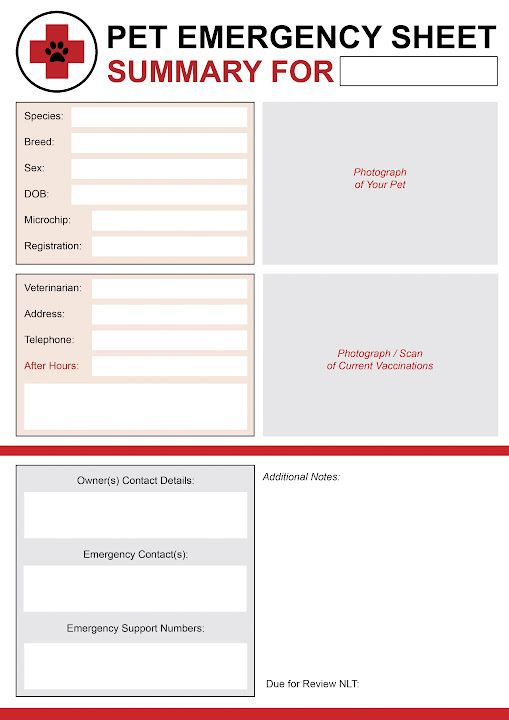 If you don't already have an emergency information sheet for your pet(s), you're welcome to use ours as part of your preparedness updates. I prettied them up and have uploaded blank copies for free download. Unlike our usual convenient JPEG printable format, these are blank PDF and fillable MS Word format for ease of use in the program of your preference, and both are fully editable for customisation - quick tips in green below if you need help. Note: Click the DOWNLOAD FILE HERE text links above to access the free template files. These freebies have been uploaded for sharing via Dropbox. The default paper size is A4 (our local standard) so remember to select "fit-to" if printing in a different size, such as standard letter. Only print what you want to use, and please remember to recycle any extra bits or offcuts when you're finished. To fill-in the information sheet in MS Word prior to printing, simply select and edit the text (blue placeholder copy denotes user content; however, all text is editable if you wish to customise further). Select a placeholder image and in the format toolbar function choose "Change Picture" (screenshot shown below), which will open a window through which you can select a replacement image from your files. 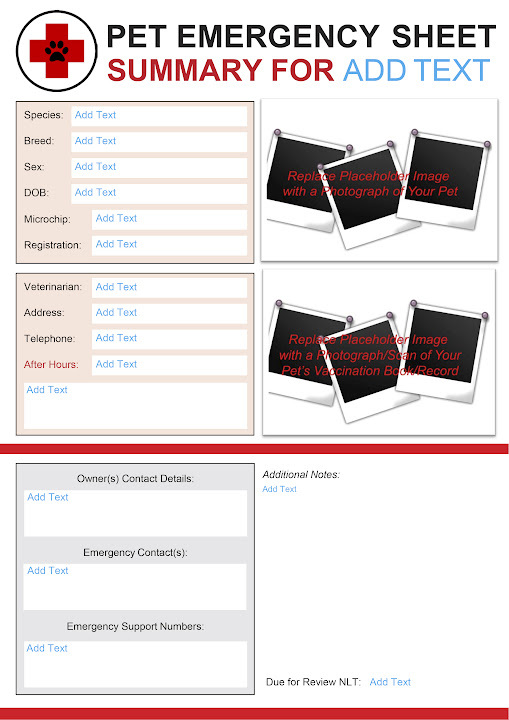 You can resize the images and/or text fields using click-drag if needed or click and delete unwanted content. Caution: Don't try to open/edit the file online direct from Dropbox, as for some reason (?) these specially formatted Word documents will usually look all wonky if you open them in Word online. Download a copy of the file and then open it on your own device. Although the PDF version is provided primarily for easy print-and-fill use, it is also unlocked for customisation in Adobe Acrobat (e.g. Acrobat DC) if you wish. Thank you for giving us the editable files. I downloaded the Word file and it was very easy to fill in with your instructions. I have two cats and I deleted the top picture then copied the top box there and put their picture together where the vaccinations went and printed vaccinations on the reverse side. You are most welcome! Glad to hear that the downloads and customisation worked well for you. It sounds like a great info sheet for your cats, and handy having it all on one page (eco-conscious too). Thanks for sharing! P.S. For anyone wondering: copy, paste, font, colour, fill, resize, delete, etc all work. I really wanted to give you a template that you could make work for your needs so the editing is wide-open. It was built in InDesign, so you will notice some sight differences from a standard document, but feel free experiment and make it yours! Awesome idea! I really need to get this sorted too. Did you buy your first aid kits pre packed or make your own pet kit? I'm making our own mini-pet kits paired with our "human" first aid kits. Most items are common-use so it seemed more efficient (for our situation at least) to have a few extras in the home kit (not sharing thermometers...hehehe...) and with the vehicle kits. I'm still trying to get my hands on a few items - the pitfalls of not living in a major city - but will share some pics when its complete as well as links on suggested contents for pets. These are great! The perfect addition to a homemade emergency kit. I always forget about the paperwork, so thank you for reminding me! You're very welcome. Take an extra minute to put a back-up somewhere accessible (e.g. emailing a soft copy to yourself or saving a screenshot) just in case. I've never needed mine in an emergency thank goodness, but having back-up info in my mobile phone has definitely come in handy and saved effort for paperwork. We just shared our experience with Creating a Home First Aid Kit for Our Pets along with handy links to do that same for anyone who might want/need to do the same.